Sanders whose regional office in Chicago covers eight states including Minnesota said the state has the second highest response rate based on the 2010 census. The census is used to apportion congressional seats as well as determine the amount of federal aid each state receives. In the 2010 census, Minnesota as able to keep its current slots of eight congressional seats when it beat the next state by just 8,739 people. There are concerns again this time that it is in a similar situation as the state’s population, while growing, is not growing as fast as others. there are also concerns that hard to count populations like immigrants might be put off by the citizenship question that is pending at the US supreme court. Lower courts have rejected the Trump administration’s attempts to include the citizenship question. The administration has appealed to the supreme court and a decision is expected this summer with arguments before the court stating on April 23. 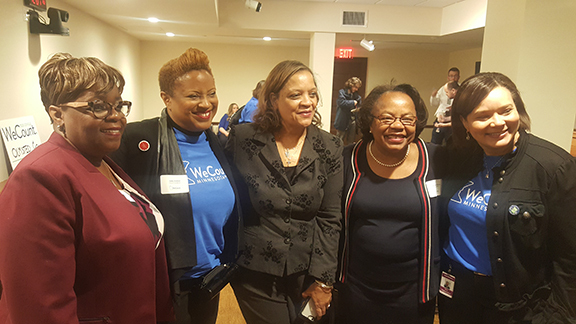 Present at Monday’s activities were former Minneapolis mayor Sharon Sayles-Belton and Sen. Mary Kiffmeyer. The two are co-chairs of the governor appointed “Complete Count” committee. Minnesota attorney general Keith Ellison announced this week that the state is joining 17 other states in challenging the Trump administration’s decision to include the citizenship question. There is feat that the question might lead to an undercount of immigrants, impacting crucial federal aid to the state. The census is also currently hiring thousands of temporary workers as it prepares for the count next year. To apply for the jobs available, follow this link.